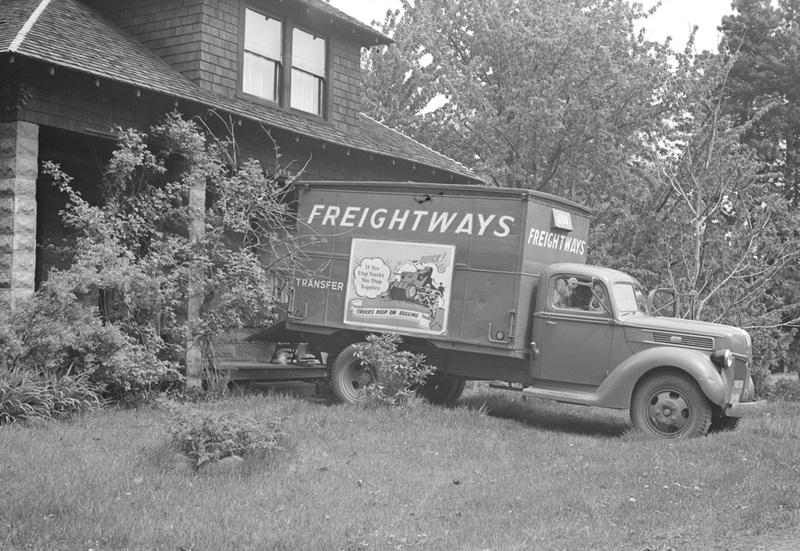 Not sure what was being delivered to the Day's house on June Street on this fine spring day of 1942, but I thought the artwork on the truck was worth sharing. Poster art and propaganda posters reached new heights during WWII. This one says, "If you stop the trucks you stop the supplies. Truck, keep 'em rolling." I'm not exactly sure what they were asking people to do. Quality and composition are so"Day." What a fine amateur photographer with a gift of seeing a study in what we all think is so mundane until decades later. I think it might have been something about the war and gas rationing - many truck and freight lines needed to keep them rolling and so did the people who depended on the cargo inside the trucks. My grandmothers piano was delivered from Hood River to Edmonds, Washington (north of Seattle) by two, wounded vets who had a freight hauling truck. It was close to the end of the war. Imagine what THAT drive must have been like! On May 13, 1942 Alva Day was down at the train depot taking photos of Japanese families waiting to board the train out of town. Perhaps Alva is storing some of their furniture. 4" rearview mirrors and no turn signals.